The Embassy and Permanent Mission of Afghanistan is seeking new interns! The Embassy and Permanent Mission of Afghanistan is now seeking interns for the late summer of 2015. Tasks and responsibilities of the position include: active participation in a large variety of formal and informal meetings (as required) and consultations at the international organizations of the UN and OSCE, working groups, seminars and conferences, to be followed by debriefing/reporting; monitoring of developments in both Austria and Afghanistan; assistance with the preparation for meetings, visits and conferences/seminars (background information, file preparation/brief, networking); drafting of notes and reports for the Embassy as well as the Afghan Foreign Ministry, Afghan authorities and other relevant actors. Applicants should be fluent in English, enrolled in a relevant University degree program (international relations, security issues, international economics, law, political sciences, or related subjects) and under 30 years of age. Further desired qualifications included: experience in drafting reports, with emphasis on excellent synthesis capabilities and an eye for practical aspects; previous internship experience with international institutions would be an asset; proven analytical skills, team spirit and flexibility also great assets; other languages are highly valued (Farsi, Pashtu and/or German) ;Microsoft Office and other IT software; high-level of motivation and dedication. The 3 month internship is full time and unpaid. No benefits, compensation, or guarantee of future employment are associated with this internship. The deadline for applications is June 5, 2015. 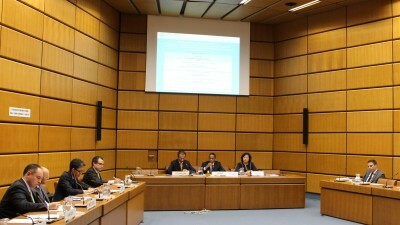 Today the Permanent Mission of Afghanistan held a roundtable entitled “Briefing on the Joint Plan of Action 2014 – 2016 for the Implementation of Technical Assistance Activities to Support the Efforts of the Islamic Republic of Afghanistan in the area of Preventing and Countering Terrorism” at the Vienna International Center, co-organized with the UNODC. Ambassador Ayoob Erfani sat on the panel alongside Mr. Trevor Michael Rajah, Chief of the Terrorism Prevention Branch, and Ms. Dolgor Solongo, Officer in Charge of Implementation Support Section I. Opening the briefing, the Ambassador gave a talk on counterterrorism efforts and achievements in Afghanistan, as well as essential future steps for the country. Highlighting the importance of combatting the global challenge of terrorism, Ambassador Erfani praised the international community for its support in Afghanistan. Speaking systemically, he pointed out the progress made on national, regional and international levels. 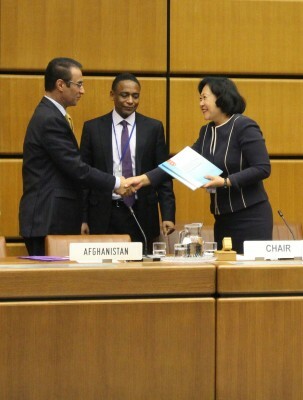 With important legislative and institutional achievements made in Afghanistan, strong regional efforts via the Heart of Asia/Istanbul Process, and accession to all relevant conventions and mechanisms, the country is working hard to improve the safety and security situation for the sake of its citizens. Pointing to the many challenges ahead, the Ambassador commented on the importance of pursuing a comprehensive, integrated and balanced approach in combatting terrorism by addressing relevant socio-economic factors, including the impact of the narcotics trade on funding terrorist activity and the role which women have to play in this arena. The Ambassador expressed the National Unity Government of Afghanistan’s commitment to addressing all the challenges ahead and the support of the Afghan people for these efforts. Ambassador Erfani was followed by Mr. Trevor Michael Rajah who commented on the achievements of the Joint Plan of Action and stated UNODC’s commitment to continuing to assist Afghanistan in the fight against terrorism. Concluding the presentations, Ms. Dolgor Solongo presented Ambassador Erfani with completed translations of the Financial Action Task Force Recommendations into Dari and Pashto. In his concluding remarks, Ambassador Erfani thanked the friends and partners of Afghanistan in the audience, and called on the continued support of the international community going forward.